The Regular Season in LNBP is slowly approaching the end. But there may be still some important changes in the final standings in the last 8 rounds. Here is the last round review presented by ESL. The most exciting game of round 34 in the LNBP took place in Aguascalientes. This derby game ended with only one-point home defeat of 4th ranked Panteras (15-16) to sixth ranked Libertadores (11-19) 110-109 on Thursday evening. Libertadores made 21-of-25 free shots (84.0 percent) during the game. They shot the lights out from three sinking 15 long-distance shots on high 57.7 percentage. The game was dominated by American players. Forward Anthony Young (200-89, college: Ky Wesleyan) fired 34 points (!!!) and 7 rebounds for the winners. Swingman Brandon Davis (198-88, college: Lamar, agency: Pro Sports) chipped in 25 points. Guard Hameed Ali (188-93, college: Texas A&M-CC) produced a double-double by scoring 29 points and 11 assists for lost side. Panteras' coach Eric Weissling rotated ten players in this game, but that didn't help. Libertadores maintains sixth position with 11-19 record. Panteras at the other side keep the fourth place with 16 games lost. Libertadores will have a break next round, and it should allow them to practice more before next game. Panteras will play again at home against Libertadores (#6) and it may be a tough game between close rivals. An exciting game between Top Four teams was played in . Second ranked Mineros faced one of their biggest challengers Lenadores. Host Mineros (24-9) defeated guests from (17-14) 87-76. Worth to mention a great performance of the former international power forward Fernando Benitez (204-89) who helped to win the game recording a double-double by scoring 16 points and 10 rebounds (on 8-of-10 shooting from the field). Eric McClellan contributed with 20 points and 5 rebounds for the winners. American-Lebanese power forward Jarrid Famous (209-88, college: S.Florida) replied with 20 points and 7 rebounds for Lenadores. Mineros maintains second position with 24-9 record having just six point less than leader Fuerza Regia. Newly promoted Lenadores keep the third place with 14 games lost. Mineros will again play against Lenadores (#3) in the next round, which may be the game of the day. Lenadores will have a break next round. Leader Fuerza Regia delivered the twenty sixth victory on Friday night. This time they beat 7th ranked Huracanes (6-25) 77-67 in Tampico. Daniel Bejarano scored 15 points and 9 rebounds to lead the charge for the winners. 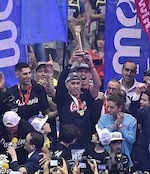 At the losing side Martin Samarco responded with 20 points. Fuerza Regia (26-7) have an impressive ten-game winning streak. They maintain first position. Newly promoted Huracanes keep the seventh place with 25 games lost. Fuerza Regia will have a break next round, and it should allow them to practice more before next game. Huracanes will play again against the league's leader Fuerza Regia (#1) and hope to secure a win. The game in Torreon was also worth to mention about. One of their biggest challengers Correcaminos (14-17) played at the court of fifth ranked Laguneros (14-17). Laguneros managed to secure a 7-point victory 93-86. Akeem Scott notched a double-double by scoring 19 points and 14 assists (made all of his eight free throws) to lead the effort. Laguneros moved-up to fourth place, which they share with defeated Correcaminos. Laguneros' next round opponent will be again Correcaminos (#5) in Ciudad Victoria. The game in Puebla was also quite interesting. Third ranked Aaguacateros (17-10) played at the court of 7th ranked Angeles (10-21). Aaguacateros managed to secure a 6-point victory 86-80 on Thursday. Kareem Rodriguez fired 24 points and 6 rebounds for the winners. Aaguacateros have a solid four-game winning streak. They maintain third position with 17-10 record having seven points less than leader Fuerza Regia. Newly promoted Angeles keep the seventh place with 21 games lost. Aaguacateros will have a break next round. Angeles will play again at home against Aaguacateros (#3) and hope to win that game. The game in Torreon was also worth to mention about. One of their biggest challengers Correcaminos (14-17) played at the court of fifth ranked Laguneros (14-17). Laguneros managed to secure a 7-point victory 93-86. Laguneros made 16-of-21 charity shots (76.2 percent) during the game. Their players were unselfish on offense dishing 25 assists comparing to just 11 passes made by Correcaminos' players. Jamaican-American guard Akeem Scott (185-83, college: High Point) notched a double-double by scoring 19 points and 14 assists (made all of his eight free throws) to lead the effort and naturalized American swingman PJ Reyes (196-88, college: Charleston) supported him with 21 points, 6 rebounds and 4 assists. Scott is a former Eurobasket Summer League player, which is considered top international summer league in the market. Even 28 points, 5 rebounds and 5 assists by American guard Kennedy Jones (188-89, college: Arlington Baptist) did not help to save the game for Correcaminos. International guard Jose-David Estrada (194-94, agency: Pro Sports) added 27 points and 8 rebounds for lost side. Both teams had four players each who scored in double figures. Laguneros moved-up to fourth place, which they share with defeated Correcaminos. Laguneros' next round opponent will be again Correcaminos (#5) in Ciudad Victoria. An exciting game between Top Four teams was played in . Second ranked Mineros faced one of their biggest challengers Lenadores. Host Mineros (24-9) defeated guests from (17-14) 87-76. Mineros made 17-of-21 charity shots (81.0 percent) during the game. Mineros outrebounded Lenadores 44-30 including 16 on the offensive glass. Worth to mention a great performance of the former international power forward Fernando Benitez (204-89) who helped to win the game recording a double-double by scoring 16 points and 10 rebounds (on 8-of-10 shooting from the field). American guard Eric McClellan (193-93, college: Gonzaga) contributed with 20 points and 5 rebounds for the winners. Four Mineros players scored in double figures. American-Lebanese power forward Jarrid Famous (209-88, college: S.Florida) replied with 20 points and 7 rebounds and American-Puerto Rican Javier Mojica (190-84, college: Cent.Conn.St.) added 19 points in the effort for Lenadores. Mineros maintains second position with 24-9 record having just six point less than leader Fuerza Regia. Newly promoted Lenadores keep the third place with 14 games lost. Mineros will again play against Lenadores (#3) in the next round, which may be the game of the day. Lenadores will have a break next round. Leader Fuerza Regia delivered the twenty sixth victory on Friday night. This time they beat 7th ranked Huracanes (6-25) 77-67 in Tampico. They outrebounded Huracanes 43-27 including a 34-21 advantage in defensive rebounds. American guard Daniel Bejarano (193-91, college: Colorado St.) scored 15 points and 9 rebounds to lead the charge for the winners and international center Edgar Garibay (211-90, college: Long Beach St., agency: Best of You Sports) chipped in 12 points and 11 rebounds during the contest. At the losing side naturalized American guard Martin Samarco (190-85, college: Bowling Green) responded with 20 points and American forward Timajh Parker-Rivera (202-94, college: Towson) scored 12 points and 9 rebounds. Five Fuerza Regia and four Huracanes players scored in double figures. Fuerza Regia (26-7) have an impressive ten-game winning streak. They maintain first position. Newly promoted Huracanes keep the seventh place with 25 games lost. Fuerza Regia will have a break next round, and it should allow them to practice more before next game. Huracanes will play again against the league's leader Fuerza Regia (#1) and hope to secure a win. The game in Puebla was also quite interesting. Third ranked Aaguacateros (17-10) played at the court of 7th ranked Angeles (10-21). Aaguacateros managed to secure a 6-point victory 86-80 on Thursday. Swingman Kareem Rodriguez (192-88) fired 24 points and 6 rebounds for the winners. 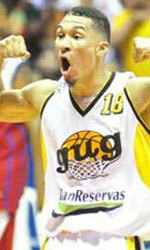 The former international power forward Arim Solares (202-83) chipped in 17 points and 7 rebounds. Five Aaguacateros players scored in double figures. Puerto Rican forward Carlos Lopez-Sosa (208-90, college: UNLV) produced a double-double by scoring 27 points and 10 rebounds (on 10-of-13 shooting from the field) and American power forward Bryan Davis (206-86, college: Texas A&M) added 13 points and 8 rebounds respectively for lost side. Aaguacateros have a solid four-game winning streak. They maintain third position with 17-10 record having seven points less than leader Fuerza Regia. Newly promoted Angeles keep the seventh place with 21 games lost. Aaguacateros will have a break next round. Angeles will play again at home against Aaguacateros (#3) and hope to win that game. The most exciting game of round 34 in the LNBP took place in Aguascalientes. This derby game ended with only one-point home defeat of 4th ranked Panteras (15-16) to sixth ranked Libertadores (11-19) 110-109 on Thursday evening. Libertadores made 21-of-25 free shots (84.0 percent) during the game. They shot the lights out from three sinking 15 long-distance shots on high 57.7 percentage. The game was dominated by American players. Forward Anthony Young (200-89, college: Ky Wesleyan) fired 34 points (!!!) and 7 rebounds for the winners. Swingman Brandon Davis (198-88, college: Lamar, agency: Pro Sports) chipped in 25 points. Four Libertadores players scored in double figures. Guard Hameed Ali (188-93, college: Texas A&M-CC) produced a double-double by scoring 29 points and 11 assists and Tony Criswell (205-91, college: Missouri) added 25 points and 8 rebounds respectively for lost side. Panteras' coach Eric Weissling rotated ten players in this game, but that didn't help. Libertadores maintains sixth position with 11-19 record. Panteras at the other side keep the fourth place with 16 games lost. Libertadores will have a break next round, and it should allow them to practice more before next game. Panteras will play again at home against Libertadores (#6) and it may be a tough game between close rivals.